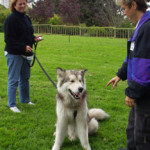 SF Dog Connect believes, first and foremost, to remember you are raising a dog, not just teaching commands and tricks. You need to ensure your dog has good manners and remains safe to himself and others throughout his life. If you haven’t read “How to Raise a Dog“, or looked over our Methodology , please do! That will explain much of what you’ll be learning about if you work with us. However, basic commands are important. The 4 commands we feel are requirements for a safe dog are: sit, stay, come and off. If a dog has mastered all of those commands, the rest will be a breeze. Sit : Sit is a basic command to help your dog settle down and teach him how to say “please”. Having a dog settle for a sit is like teaching a child to say please. Your dog can ask: “Please pet me”, “please feed me”, “please let me go out the door”, or “please throw my ball”. A dog should not learn that whining, jumping, barking or swatting with his paw gets him what he wants. A dog needs to be told what to do – just as much as what NOT to do. You don’t want me to jump on guests? What DO you want me to do? Sit to get petted?? I can do that! He should learn that sitting might get him what he wants… at least it’s a good start! Stay : Your dog shouldn’t lunge into her food bowl the second you try to put it down, or try to cross the street in front of you. She also should learn to be patient. After all, dogs in the past had to wait for hours for prey or food. So, any dog should be able to wait at least a minute for food, toys, treats, etc. Teaching a dog to sit, relax and wait is invaluable for when you want to allow a child to pet her or allow an elderly person to pass by on the sidewalk. Making sure your dog can get into a calm state and wait patiently is an important part of raising her and ensuring her safety and mental health. Come : Your dog needs to come to you when you’re ready to leave the park, or if he slips out of his collar on a busy street, or if he gets out of the front door that was inadvertently left open. He also needs to come to strangers and sit and allow them to look at his ID tag so they can call you and reunite you quickly and easily. A dog that doesn’t come when called is hard for even the Animal Control officers to capture. So, you want to make sure your dog always responds eagerly to this command and comes right up to people and allows anyone to look at his ID. Off : Dogs need to know some things are off limits. Some people do not want their dogs on the furniture, and most people don’t want their dogs jumping on their counters. No one wants their dog to eat something disgusting or dangerous she found on the beach. Dead animals, feces, chicken bones – we’ve seen it all. Save yourself an ER visit and teach your dog to get off of – and stay off of – anything you command. This command is a definite life saver, let alone a great convenience for bringing your dog around others or into new environments.